As major corporations move further and further away from paper transactions (both alleviating storage and environmental concerns) by embracing electronic book-entry form, one type of ownership method called the Direct Registration System (DRS) has become particularly popular for blue-chip stocks. 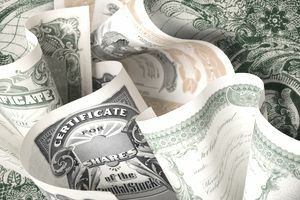 Investors who hold paper stock certificates or participate in the dividend reinvestment programs, also known as DRIPs, of certain businesses are likely to frequently encounter DRS. As with most new investors, it is likely you invest in stocks through a brokerage account. When you place a trade order and the purchased stock appears in your account, your shares of stock are registered in a street name. That is, if you own 1,000 shares of Apple through a broker or global custody account - let's say for the sake of illustration that you choose Charles Schwab because it is one of the largest in the world - your stock is pooled with all of the other brokerage clients who own shares of Apple and reported on the books of Apple's transfer agent as "Charles Schwab & Company". You are the beneficial owner of your 1,000 shares, but Schwab is the owner of record. Then, within its own accounting and database, Schwab breaks down which client owns which shares, and provides trade confirmations, brokerage statements, and tax records. At least in the case of margin accounts, if the brokerage firm goes bankrupt, you are left holding the bag with a general claim against the firm (cash accounts aren't subject to rehypothecation and should be entirely segregated). What will happen to your shares that were held in street name? Historically, this hasn't been a problem, though every few decades there is a major blowup that costs a lot of investors a lot of money. Generally, if there is a shortfall, you may find yourself relying on SIPC (Securities Investor Protection Corporation) insurance, which has limits. Between these twin guardrails of asset segregation and SIPC insurance, it has been exceedingly rare for a brokerage customer to fail to receive his or her portfolio back, in full, in the event of a brokerage bankruptcy. Still, for those chronic worriers, the Direct Registration System provides a safeguard. In 1996, the Direct Registration System was created for people who didn't want their stock registered in the name of their brokerage firm. Sometimes, these investors buy and sell directly from the transfer agent. Other times, they work with their favorite stock broker to arrange trades registered through the DRS. Protection against counter party risk: If your stockbroker goes bankrupt, and your shares were held in a street name, you are going to have to go through the recovery process, and possibly get reimbursed, if eligible, from SIPC insurance. In contrast, if your stock is held through the DRS, it shouldn't matter because your claim is with the company you own itself, not the intermediary. Correspondence directly from the company itself: Stock Stockbrokers are notoriously slow when it comes to delivering annual reports, 10k filings, proxy statements, and other materials from the companies you own. When you are registered directly with the transfer agent through DRS, the documents are mailed to your address of record, often promptly. Stocks held through DRS cannot be lent to short-sellers: When you hold stock in a street name, your broker lends your shares to short sellers, who can drive down the price by selling short the stock. The shares they borrow could have even come from your account! This can sometimes lead to an interesting tax problem when the dividends you receive, which would otherwise meet the qualified dividend requirements to gain the highly favorable tax rates ranging from 0% to 23.6% inclusive of the so-called Obamacare tax, technically are taken away from you because the short-sellers reimburse you with something known as a Payment in Liu of a dividend, or PIL. Using DRS makes it easier to take advantage of DRIPs: Many companies offer dividend reinvestment programs, or DRIPs. These are great for investors who want to plow their dividends back into purchasing more shares of stock with little or no commissions or fees. Over time, reinvesting your dividends can have a massive influence in your ultimate wealth. When you use the Direct Registration System, you can make a phone call or send in a signature and enroll in the DRIP. Making gift transfers to friends or family can be easier with the DRS: As an added bonus of using the Direct Registration System, you can often gift shares to family or friends by having the transfer agent setup a DRIP account for them, funded with a transfer of shares from your account into their account. This can be a great option for an investor who has built up a large position in a particular company and wants to give his or her children shares up to the gift tax limit exclusion each year. I know of one family that held hundreds of thousands of shares of General Electric, built up over a lifetime of disciplined investing, who used this method to pass down ownership to subsequent generations. The eldest generation would fill out some paperwork once a year and the children and grandchildren would see deposits of new shares added to their account statements every twelve months. The biggest disadvantage to using DRS is that you can't sell your stock immediately. You have to submit instructions directly to the transfer agent, who then pools your sell orders with other sellers, and executes the trade on a predetermined schedule. That would make it impossible to sell off in the midst of a panic as the world fell apart or if you needed money quickly. At best, you'll need to allow a minimum of several business days before you can access your cash. Another option for possibly-faster liquidations is to have the transfer agent managing your DRS entry in a particular company move your shares to the brokerage firm so the stock broker can sell quickly. This would take at least a few business days to achieve, perhaps longer. Doesn't want the hassle and physical security risk of holding paper stock certificates. There are many unique circumstances and situations to consider when deciding whether or not Direct Stock Registration is right for you. You'll have to figure out your opportunity cost. For some of you, DRS warrants a closer examination.